What Is Category Management? Category management is a strategic approach to how an organization organizes to buy goods and services from vendors as a single entity. The federal government spends about $500 billion a year on goods and services. More than half of this spending is for goods and services that are common across federal agencies, such as training, overnight delivery services, copier machines and travel services. However, these are often purchased individually by more than 3,300 buying offices and 40,000 contracting officers. By “buying as one,” the federal government could leverage its buying power as a large customer and this could also reduce the need for vendors to constantly bid on redundant work. A 2016 study estimates that when used effectively, this approach can conservatively generate cost efficiencies of 7.5 to 12 percent of total procurement spending. For the federal government, this could result in more efficient spending of up to $40 billion a year, if this approach were to be widely adopted. In the private sector, savings have reached 20 percent or more on annual procurement spending. 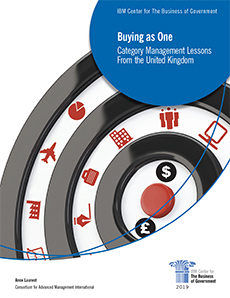 The Office of Management and Budget (OMB) began promoting the use of category management in 2014 – four years after the United Kingdom began its effort. OMB is currently pursuing strategies to cumulatively avoid $18 billion in unnecessary procurement spending by next year and, according to its latest progress report, has made significant progress toward that goal. It has highlighted this effort as one of its 14 Cross-Agency Priority Goals in the President’s Management Agenda. But, based on the United Kingdom’s experiences, it potentially could achieve greater savings. The U.K. Government’s Approach. A newly-released study by Anne Laurent for the IBM Center for The Business of Government details the U.K. government’s adoption of a category management initiative in 2010 and its evolution over the next eight years as it was implemented. Created a strategic framework. The U.K. Cabinet Office created a new central agency, the Government Procurement Service (GPS) to lead the effort. Ultimately all agencies were mandated to buy common goods and services in those nine categories through governmentwide contracts run by GPS. GPS set a goal of increasing the amount of “spend under management” to all £13 billion in common central government procurement by its departments and created a set of category management teams to develop governmentwide strategies, approved by agency procurement heads. Strategically managed both spend and demand. By consolidating government demand and developing deeper knowledge of suppliers and their supply chains, GPS was able to identify cost-effective, high-performing suppliers in each category. It was also able to identify potentially wasteful spending by agencies and challenged those purchases. Undertook contract and supplier management. Each of the nine category teams crafted governmentwide contracts and identified best-in-market suppliers. Contracts were tailored to the different levels of risks and value involved in supplier relationships. Ultimately, this led to streamlining the number of different contracts and suppliers and establishing ongoing relationships with strategic suppliers. For example, a single government buyer became the expert point of contact to inform discussions and negotiations each of the government’s strategic suppliers. Used spend, demand, and market analyses to change buying approaches. Laurent discusses how the category management initiative changed how the U.K. government bought goods and service. For example, she writes that “The U.K. government was buying computers through hundreds of suppliers and more than 20 major resellers and systems integrators, and paying higher prices in comparison with commercial buyers.” With this new spending data, and more extensive knowledge of suppliers and their networks, the government changed how it bought computers, negotiating directly with original equipment manufacturers. Category management should not be a free-standing initiative but be integrated into broader acquisition reform efforts and have sustained leadership from the top. It’s not just a procurement method, it’s a strategy for obtaining capabilities needed to deliver on policy and mission goals. As a result, top leaders in the government must be seen as owning the initiative, and ensure it is cascaded to agencies, or internal resistance will stymie action. Strategically manage spending and demand by developing greater ability to analyzing data. Laurent found: “Detailed, accurate, and current accounting that enables spending visibility and control has led to U.K. government price and demand management savings” She recommends the central collection and analysis of agency accounts payable and contract data on behalf of all federal agencies. Strategically manage suppliers that contract with multiple agencies. Laurent says: “Moving to a strategic supplier management regime like the United Kingdom’s could provide much-needed intelligence about and leverage with large suppliers.” A possible model for bringing in temporary industry talent might be along the lines of the U.S. Digital Service’s approach. The United Kingdom may be further ahead in implementing category management than the United States, but the U.S. and other governments could adapt these experiences to transform the buying of common goods and services “as one” in years to come.